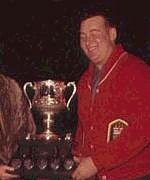 The following is an excerpt of an article penned by Warren Hanson for the 1999 Brier in Edmonton, on the life of the late Hec Gervais. He has kindly consented to allow me to reproduce this article here. Most kids idolize sports figures, people they dream of emulating as they grow toward adulthood. When I was a child in my native Edmonton, my heroes were curlers and football players. My goals were to play football for the Edmonton Eskimos and develop into a championship curler like Matt Baldwin and Hector Gervais. In 1958, Baldwin was in the process of winning his third Brier and Gervais was the new kid on the block, and the one most likely to challenge the king. While Gervais hadn't yet made an appearance at the provincial level, he had been gaining a good deal of attention with repeated first-event and aggregate wins in the annual Edmonton bonspiel. I remember the radio broadcasts of those final Saturday finishes when Gervais - always referred to as the large potato farmer from St. Albert - would generate some magic to win another bonspiel title. In 1960, Gervais teamed up with Baldwin to form what most felt would be the 1960 Alberta championship team. I was just 16 and had just acquired my drivers' license, which allowed me to drive from my home north of Edmonton to watch Baldwin and Gervais humble their opponents in the finals of the Northern Alberta playdowns. But they went down to defeat a week later in the Alberta final and that was the end of the Super Squad. Gervais was back on the teehead the following year with two relative unknowns -- Ray Werner at the second and Ron Anton at third. Wally Ursuliak, no stranger to the Edmonton curling scene, rounded out the team at lead. Anton was the real surprise. Only 19 years old, he threw the stone with a balance and accuracy seldom seen. Gervais had apparently scouted the Medicine Hat native for a few years before Anton entered a Catholic seminary to become a priest. He had left the seminary to become Gervais' third. The new team was a solid unit and swept the Alberta playdowns to enter its first Brier at the Calgary Corral in 1961. Saskatchewan's Jack Keys proved to be a formidable foe, but in the end Gervais prevailed and managed his Brier win. 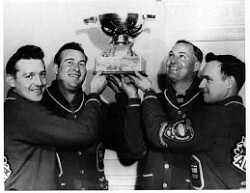 The Alberta foursome appeared again at the 1962 Brier in Kitchener, Ontario, only to be defeated in a playoff by Saskatchewan legend Ernie Richardson. By the end of that curling season, all of Gervais' team members were household names in Edmonton curling circles, the curlers kids most wanted to emulate. Through the mid-1960s I struggled up the difficult competitive ladder in Edmonton. During that same period, the Gervais team experienced its own struggles and, while its success on the money trail was second to none, a third appearance at the Brier evaded it. In 1968, I was playing third for Wayne McElroy; we thought our team was solid and that we had finally arrived. We breezed through the A side of the city playdowns, only to find Hector Gervais standing between us and a berth in the Northern Alberta playdowns. It was a game to remember. It went right to the wire, and our young team squeezed out a last-rock victory. Gervais dropped to the B side but lost another qualifying game and didn't make the Northern final for the first time in years. Although we lost that Northern final, one of our greatest accomplishments had been winning the A section final against the two players who had been the idols of my youth. Many changes took place in the Edmonton curling scene during the next two years and, in 1970, I made a fresh start with Ron Anton as my skip. For the next three years we head great success on the cashspiel circuit but were unable to win a zone in the city playdowns. One of our greatest obstacles in achieving that goal was Anton's former skip, Hector Gervais. During those years Gervais was struggling, but whenever he played us he was at his best. During those three years we never beat him. It was one of the interesting traits of this amazing man: he was repeatedly able to rise to the occasion against former teammates. Anton and I met after the 1972 season to discuss our future. Anton said he didn't feel comfortable on the teehead and suggested he would prefer playing third, where he was one of the best in the game. We had two choices: if we were to continue to curl together, either I had to skip or we had to find a new skip and I would play second. After considerable deliberation, we decided our best move would be to find a new skip. We tossed a couple of names around and at some point Anton suggested Gervais. We thought about it for a couple of days and finally decided to give him a call. A short time later we met and the deal was sealed. Darrel Sutton, who had played lead for a year with me and Anton, rounded out the team and away we went into the 1973 season. We did well on the cash circuit but the Edmonton playdowns were a disaster. Memory tells me that it was all over for us in about four games. The failures continued to pile up during the fall of 1973. Although we had been quite successful a year earlier on the bonspiel circuit, we couldn't repeat. Gervais was now 41 years old and it seemed that time had taken its toll. He still had an occasional burst of brilliance, but he was inconsistent and his interest seemed to be waning. Shortly after Christmas, Anton and I met to discuss the upcoming playdowns. It seemed our season would be short-lived, but we decided to give it our best shot and finish out the year. 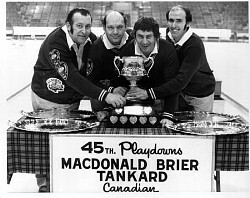 I will always remember the first day of the 1974 city playdowns. We were playing on an outside sheet of ice at the Shamrock Curling Club against a worthy opponent by the name of Ken Watson (no relation to the former Manitoba great). We were in the second end and Darrel Sutton and I were standing at the hogline watching play on an adjacent sheet. All of a sudden I heard a yell from behind our sheet: "Hey, you guys, we're playing on this sheet of ice." I snapped my neck around so quickly I nearly got whiplash. The voice was Gervais' and, while he had been pretty passive for several weeks, it seemed he was back in the game. For the next month the man was brilliant, making shot after shot, many of which seemed impossible. We won the city zone, the Northern Alberta berth, the province and, finally, the Brier in London, Ontario. Although we lost a last-rock semi-final in the world championship in Berne, Switzerland, our season ended as a dream come true. A team that had struggled throughout almost the entire season had, under the guiding hand of a once-great champion, gone from oblivion to the world curling championship. During those few short weeks I was fortunate to witness the magic of one of the greatest curlers of all time. In many ways, Gervais' performance defied all logic. A huge man - about 270 pounds - he delivered the stone in a totally unorthodox manner and very often called shots that seemed impossible. Yet he came through time and time again. His key demand of his players was to have faith and never question what he was doing or calling, regardless of how wrong you felt it was. Some felt Gervais was difficult to play for - and for some he could be. Although he was known as the Friendly Giant, he certainly wasn't friendly on the ice. No one was more competitive and demanding of his team. He was a man of good humor and quick wit and always liked to make jokes about his teammates. One of Gervais' tongue-in-cheek philosophies was that it would be great if you could create a team that would have a skip and three robots. He also suggested to his front end on more than one occasion that all they had to do was sweep and throw the rock; he would do the thinking. I could go on with Gervais stories for pages. He provided the greatest curling season of my life and I will never forget the thrill of winning and playing in a Brier with the big guy and Ron Anton. On July 19, 1997, Hec Gervais succumbed to a massive heart attack at the age of 63. He had been plagued by heart problems for almost 20 years and had undergone heart surgery in 1987, but it was still too early for him to die. His passing was a great loss to curling - he was a legend around the world - particularly in his native Edmonton, where he was an institution. Copyright © 1998 Labatt 1999 Brier. All Rights Reserved. Warren Hansen is the CCA's Manager of Event Operations & Media, as well as Managing Editor of Extra End magazine.